With terrorist attacks proliferating across the world, more than ever there is a need for knowledge on the drivers of violent extremism. While these might be a mix between individual and socioeconomic elements based on the local context there is also a discussion about the role of ideology. In this ISDP Forum, Professor Mohamed Tozy of Sciences Po Aix will give a presentation that seeks to conduct a historical sociology of Islamist movements, to deconstruct their theological and political discourses. 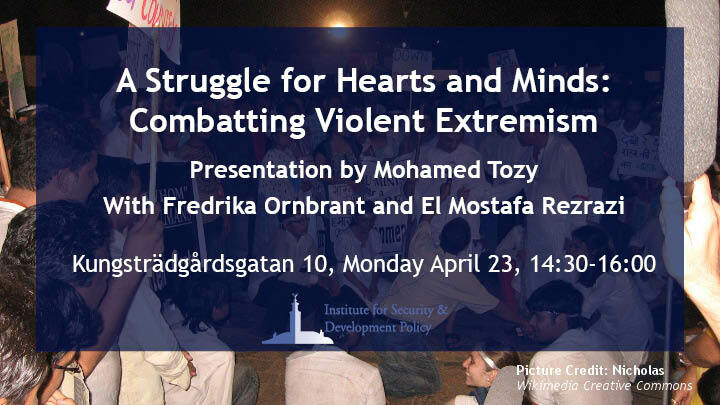 After Professor Tozy’s presentation, he will be joined onstage by Ms Fredrika Ornbrant, Ambassador and Counter Terrorism Coordinator at the Swedish Ministry for Foreign Affairs, and Dr El Mostafa Rezrazi, Professor of Crisis Management and Senior Fellow at the OPC Policy Center. The Ambassador of Morocco to Sweden Ms Amina Bouayach will give introductory remarks. This Forum will be moderated by Dr Niklas Swanström, Executive Director of ISDP.